This analysis is a section from a Nov. 11, 2010 survey report by the Pew Research Center for the People & the Press, Mixed Reactions to Republican Midterm Win. Read the full report and survey methodology. 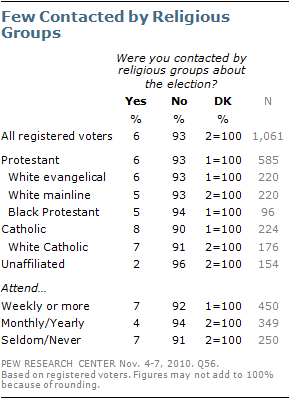 Compared with 2006, fewer voters encountered information on parties or candidates in their house of worship. Among registered voters who attend worship services at least once a month, just 16% say election information was available, compared with 25% in 2006. 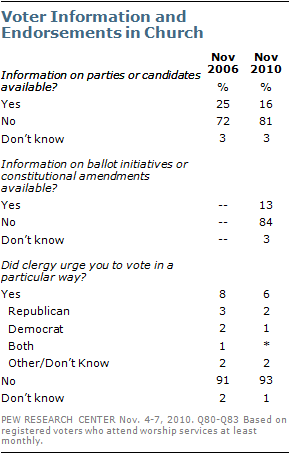 Only 13% say their place of worship provided information about state and local ballot initiatives or constitutional amendments. Even fewer (6%) say their clergy urged them to vote in a particular way, with similar numbers saying they were encouraged to support Republican and Democratic candidates (2% vs. 1%). Among white evangelical Protestants, 16% of churchgoers say campaign information was made available at their place of worship, down from 30% in 2006. Similarly, far fewer Catholics say these materials were made available at their churches this year (10%) than in 2006 (21%). 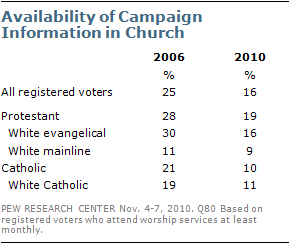 In 2006, both white evangelicals and Catholics heard significantly more than white mainline Protestants about politics in their churches; in 2010, differences between these groups have essentially disappeared. Outside of encountering political information in churches and houses of worship, only 6% say they were contacted by religious groups about the election campaign, a number that differs little across religious groups or levels of worship attendance. For instance, 7% who attend religious services weekly were contacted by a religious group, similar to 4% of those who attend monthly or yearly and 7% of those who attend seldom or never. In addition, 6% of Republicans, Democrats, and independent voters alike were contacted by religious groups about the election.